Vice President Yemi Osinbajo yesterday tasked Textile Workers’ Union of Nigeria to do more on advocacy with a view to encourage Nigerians to prefer home-made textiles. He decried the situation whereby many Nigerians have become used to imported goods to the detriment of locally- manufactured ones. Osinbajo gave stated this when a delegation of the union led by its National President and General Secretary, Comrades Oladele Dosunmu and Issa Aremu paid him a courtesy visit at the Presidential villa, Abuja. “People want to be fashionable, people want to wear nice things.An effective advocacy by the textile industry and unions is therefore needed to change such attitude in favour of Nigerian products”, he stated. He reminded the union that President Muhammadu Buhari had said repeatedly during the campaigns and afterwards that he would revive the textile industry which would create more jobs for Nigerians adding that the promise would be fulfilled. “We can create a significant number of jobs if we revive and sustain the textile industry and time has come for us to get back to the textile industry value chain”, the Vice President added. He also acknowledged various challenges facing the industry including smuggling and the problem of electric power shortage but said it is the desire of the present administration to solve the problems. According to him, power supply was critical to the industry and government was working hard to provide adequate power for industries and other uses. He said it was the intention of the administration to locate power plants for and around industrial locations adding that there is the need for consumers to address the issue of paying for the facility in order to sustain it. 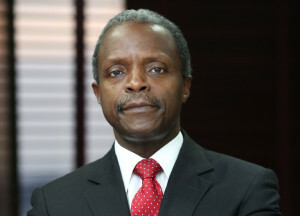 Osinbajo said, “It is important for the union to dialogue with the power companies. The time has come for us as a nation to achieve something meaningful in this direction. “As a nation time has come for us to give ourselves timelines and deadlines to achieve something and get things done”, he added. Earlier, the President of the union, Comrade Dosunmu informed the Vice President about the forthcoming 27th Annual National Education Conference of the union holding in Kaduna on August 27 with the theme Buhari’s Administration: Revival of Textile Industry and Employment. He then commended the plan of the Buhari administration to revive the textile industry adding that such an agenda will lead to job creation. The General Secretary of the Union, Comrade Aremu noted that the textile industry was one of the highest employers of labour in the past accounting for about 1.5 million jobs in the 80s in the country.